In 2003, I made a trip outside Australia. I was 21. I visited a few different places. The story I want to tell happens in June, in Siberia. Siberia is more than just a region of northern Asia. It has a mystique, a reputation, a vague familiarity, like “the Amazon”, or the moon. For a lad from Melbourne, Australia, Siberia conjured nothing more than an impression of bleak, unremitting despair, built on a lurid history of gulags, hard labour, snow, ice and darkness. Embarking on a train journey through this part of the world, therefore, seemed like a trip best saved till summer. In early May, four green Australians set off for a tiny town on the shores of Lake Baikal. Armed with the geographical preconceptions of a monochrome wasteland, Lystvyanka is a monumental surprise: a lakeside town of wooden houses and small green fields, views of snowy mountain peaks on the other side of the world’s deepest freshwater lake, forests in spring: Siberia lives! They are gentlemen of substance, men of the world, and scholars. Jook’s favourite thing is beer, James’ favourite thing is bicycles and Johnny’s favourite thing is throwing rocks. My favourite things are Foucault and filme noir. Not really, but that’s the advantage of holding the pen. We had known each other for a number of years, and had been travelling in each others company for approximately 3 weeks and one day. We arrive in Listvyanka in a sedan. (It was a Lada if i remember correctly*). We disembark to see some other tourists swimming in the waters of the lake. They gleefully report that it had been solid ice only a few weeks before. We listen sceptically, and go to see what less frigid options are on offer. After a couple of minutes of solid sightseeing, Listvyanka’s most obvious attractions have been exhausted. 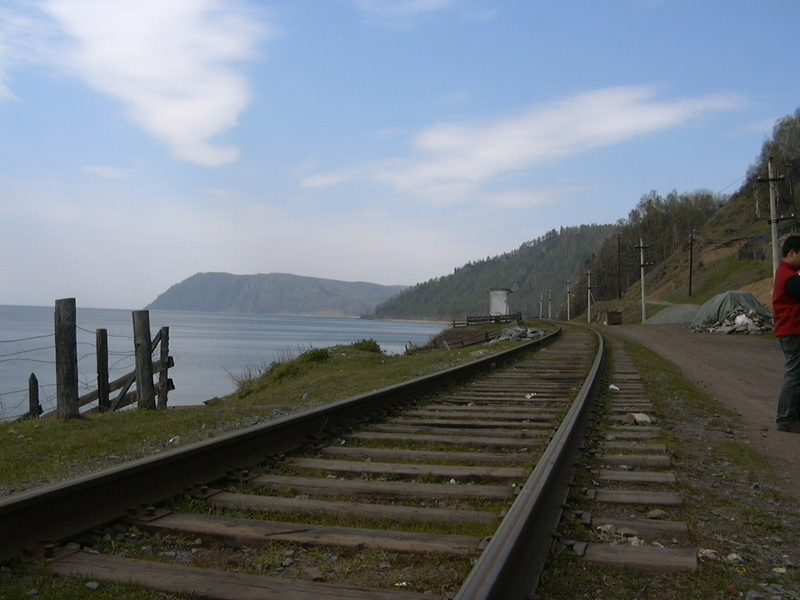 After some days, we elect to spend a morning going to the nearest town, Port Baikal. And that’s where the story starts. There would be blood. By that night, one of the four of us would have his insides dribbling down his outsides. And I wonder if someone had told us this fact on that sunny morning, whether we each would have been happy with a 75 percent chance of corporeal integrity. 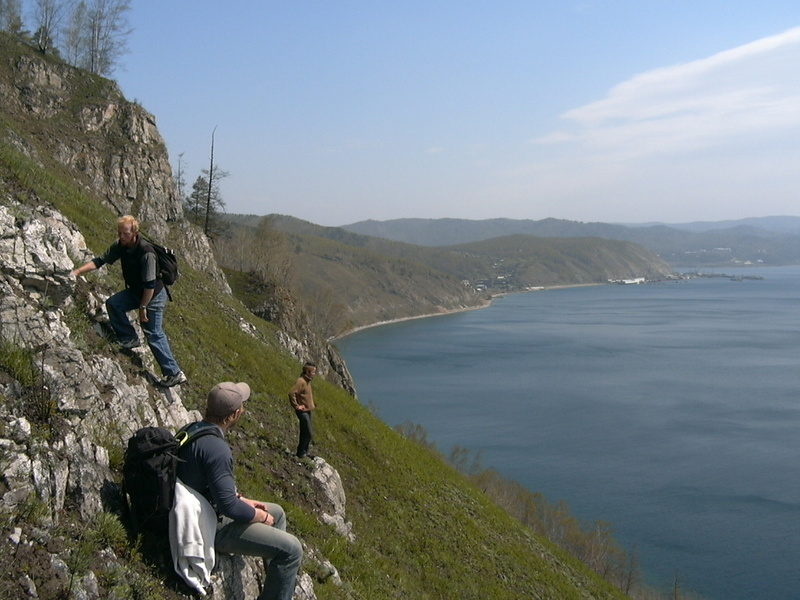 Port Baikal has little to recommend it apart from the boat ride between it and Listvyanka, which tempts tourists with promises of, amongst other things, vertigo, as you look into the deepest lake in the world. And the clear, inky blue of at least a kilometre of water underneath your suddenly white knuckles delivers on the promise, and gives rise to a few more questions about the humble little ferry than occurred when buying your (now worryingly cheap) bilyeta (ticket). We board the crowded ferry and due to disagreements related to which deck provides the best views, end up without a seat. The lake is large, a thousand kilometres long and wide enough that the distant shore is just a suggestion. We have backpacks filled with lunch and bottled water. We wander the decks before the ferry is untied by the deckhand, a skinny boy of no more than 18, with a grimy tracksuit and a shaved head. Among the Russian travellers in their heavy boots and furry hats, there is one other conspicuous customer. He is obvious because of colour, most of all. Russia seems to be comprised largely of browns and greys, concrete and dirt, clouds and faded cold. This man is wearing a yellow jacket, blue jeans, and baseball cap that just covered his blond hair. Just as the ferry begins its journey with a majestic low bass note from its foghorn, the tourist approaches us. Then James says: How does your Californian accent go here in Russia? The tourist looks confused: Sorry? James, compassionately: How do they react to you being American? The ferry moves off and turns sharply right, and goes along in the shallows for about three kilometres. End of joyride. We disembark, and we are now officially in Port Baikal. The boat turns back to Listvyanka. The ferry-load of passengers melts into the countryside as we investigate the charms of Port Baikal. It’s key features are: a post for the ferry to tie up to, a disused train line, and a semi-distant view of the hamlet of Listvyanka. We then go for a walk. Johann (the trans-Atlantic accent) is coming too. We walk along the disused train-line. The lake laps against the smooth stones of the shore at our left, and steep hills loom at our immediate right. Before we have been going for more than a few minutes, a shop appears. It is a square portable building, selling vodka, pot noodles and postcards. James and Johann investigate it extensively. Jaiook Johnny and I pass the time throwing smooth stones into the water. Then we continue along the lake. Eventually, walking along the shore gets monotonous and we go up. From the hillside, the lake is a mirror for the snowcapped mountains on the far shore and the powder blue sky. It is beautiful as we rest and admire the view from just below the top. Lake Baikal is enormous. Right at the top, the hills get steep and rocky. Cliff-like. Johann, Jook and James find a path to the top on the grass, but Johnny and I reckon we can climb through the rocks. The others disappear off as Johnny and I test for handholds. There are caterpillars all over the rockface, and they are spinning little sticky cocoons that get on our hands. We persevere. After a while I see that Johnny has made quite a lot of progress up the cliff compared to me. He is quite high up. I would estimate he is about four metres up the not-quite-vertical rockface when he falls. He makes exactly the sort of noise you would expect a film director to suggest as he loses his grip: Woooah! As he falls he manages to twist around so that he is face-out from the cliff. He slides down on his back as I grip the rockface and watch. When he hits the grassy slope below, he pops up on his feet and stops. The many loose shards and scrabble continue to cartwheel down the slope and end up with all the other rocks he has propelled into the lake. Dusts his hands on his jeans. “Yep.” Starts to climb again. The climbing is tricky. A couple of times I wonder whether it would be smarter to go back down than up. The sun is shining though, and admitting defeat would be uncool. A little while later I am nearly at the top, and I am stuck. My next handhold is nowhere to be seen. Little caterpillars are trying to coat me in sticky threads. I go to scratch my nose, get sticky stuff all over my face, and when I grab my handhold again it turns into a whole lot of little stones and tumbles down past my boots. Oh. Naturally, I increase the pressure on my other handhold, and experience the newly familiar sensation of having it crumble into nothingness. Hmmm. Time shifts to super-slow-motion. There’s a quiet rattling noise as the rock shards that formed the handhold clatter down below. I wonder what bits of my life will feature in the highlights reel you’re supposed to get before you die. But then I remember I still have my footholds, so I lean in against the wall. I hug it. The caterpillars help me adhere to it. There are definitely no more places to put my hands. I try to remember why we are climbing. I try not to imagine falling to my death. Would I die? I can’t quite be sure I am high enough to die. Definitely high enough to be paralysed though. I have a vision of me going back on the ferry semi-conscious, on a makeshift stretcher. Hey, that’s not so bad. A family of caterpillars is making a nest on my neck. I tell myself that’s fine. At least they’re not poisonous. They couldn’t be. Could they? I seem to be higher up than I remembered. I was wrong, I would definitely die if I fell. Especially if my head landed on that sharp rock. Then I hear some yelling. Johnny has found a way up. A face appears from above. He provides a bit of advice for the next few steps. After some encouragement I lunge across a bit of a gap and find a handhold that doesn’t collapse. Pleasing. Several minutes later I arrive, sliding on my stomach, hyperventilating, on top of the cliff. The view is verdant. Siberia is surprisingly lush. The others have wandered back to the ferry post. There’s a small group waiting for the ferry. We sit. It’s a beautiful day. The conversation turns to Johann’s experience in Russia. He is an exchange student living in Moscow and is competent in Russian. During his semester break he has flown out into Siberia in order to experience the famous railway journey back. The ferry arrives, just like before. But unlike before, it disgorges onto the foresaken ground of Port Baikal a very large number of girls, dressed in French maid outfits and beauty pageant style sashes. We are incredulous and excited to see them. They are incredulous and seem thrilled to see us. We take their photo. They take our photo. Our combined creative powers are not up to the task of explaining the phenomenon and we ask Johann to find out what is going on. He makes enquiries and reports: The last day of school. This does not really seem to explain the fairytale nature of what is happening. The girls mill around as we smile and exercise our very limited Russian. Until the ferryman indicates it really is time to untie the tub and go back to Listvyanka. Fond farewells made, we board the boat. It is relatively empty and we would have our choice of the decks. Except that some Russian men accost us. There are three of them, two of which are in Military dress. We have become used to seeing lots of military men in Russia. A few days before a drunken missile captain had been telling us, at length, how easily he could wipe Australia off the map with a push of the button. And George Bush too. Boom. Anyway, these Gentlemen insist we join them for vodka and cod. The vodka is Ruski Standard, which is top shelf. We sup. The Generals are visiting Port Baikal, because it is the source point for Baikal Water, and the Army is signing a contract to buy bottled water. The Russian Army is a large and no doubt thirsty organisation. While it is possible they are celebrating some sort of shady co-payment or gratuity, as the silken vodka crosses my lips I imagine that they are merely toasting the quality of the troops’ water source. Let me tell you about Russian vodka. It might be the pure Lake Baikal water they make it from, or the clear Siberian air but Russian vodka tastes different to the stuff we get in the west. Before we have time for another round of shots and cod, the ferry finishes its journey and we are back in sunny Listvyanka. And it is full of buses. Buses full of girls in French maid outfits, and young men in crewcuts. Is this even happening? It occurs to me that maybe we died on that cliff and have gone to heaven. It would explain the sequence of events since – uniformed women, free vodka and then more uniformed women. Johnny believes the explanation is plausible. While considering our mortality, we repose in a lake side cafe. Jook gets a round of beers . While enjoying a delightfully refreshing Baltika brand beer in the afternoon sunshine, James is approached by another person who is clearly a tourist. She is Finnish, and is travelling with her four friends. Would he take their photo? He would. Would they like to join us at our table? They would. Four Finnish girls and a Japanese exchange student. Four Australian boys and a Swedish exchange student. They drink beer. We drink beer. There are introductions, there is laughter. We each learn five new names. We find out about their journey, and they find out about ours. We tell them about the crumbly surface strata that characterises the local geology, exaggerating the danger, and understating the terror. We have a plan to go and get some dinner, but agree to meet them again later in the evening. The question of our status with respect to the after-life remains wide open. Johann the Swede has no accommodation and sorrowfully takes the last bus to Irkutsk. We dine at the guesthouse amid much excitement and anticipation. James spends some time fixing his hair. At about 9pm, as we are leaving, the sun sets slowly over the hills behind the lake. On our way out, some of the school-finishers stop us in the road and invite us to drink with them. They are at a roadside bar that we haven’t seen before. The night is young, and we are open to cultural experiences. We decide to stop in for one drink before going to meet the girls. 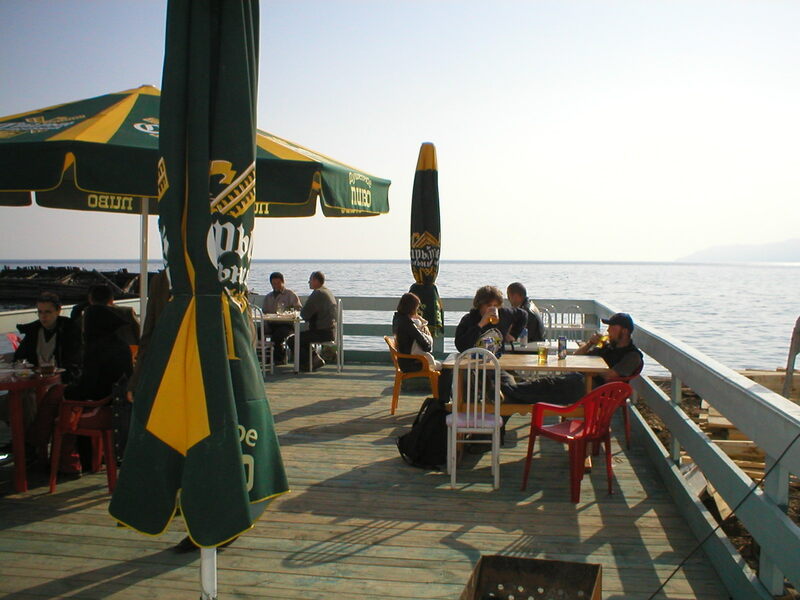 The bar is a one-room affair packed with young Russians. It is painted lime green throughout. The girls have changed out of their French maid outfits, the boys have scarred heads. We drink and chat. We toast the end of their schooling. Some of the kids speak English well. We buy bottles of vodka. We will leave to meet the Finns. Soon. One more drink. How to explain the slow loss of detail? The night has its own momentum. The music is bad Russian pop. Some people are dancing. And then, we are all split up. James is talking to French maids. Johnny is talking to boys. I am at the bar. I talk to Johnny and he is buying the boys yet another bottle of vodka. Then I see James and he is getting pushed around. He is pushing back. I intervene. Time check – It seems to be about 1am. We gather Johnny and go outside. The Russian kids are milling around. There is more pushing. We stand outside, under the stars and assess the situation. We are bigger, but there are more of them. Each of them has more scars on his head than we could muster between the three of us. The heads glisten under their crewcuts. We bunch together. There is not a coordinated assault on us, just occasional yelling and pushing. The alcohol numbs feelings beyond confusion. But a question slowly forms. Isn’t something missing? Where’s jook? Johnny does a quick scope of the inside. He emerges without Jook. We consider the situation. Jook might have already gone home. We stumble off. At the top of the lane, our guesthouse is dark. Jook is not on the couch. He is not asleep in his bed. Maybe he took off to find the Finns? Maybe he’s fighting a pack of Russian assailants, single-handedly, like Jackie Chan. We prepare to head out again, and arm ourselves, in case. James believes that a small plastic padlock is not much of a weapon. I am forced to disagree, and carry it threateningly in my left hand. The owner of the guesthouse has been roused by our quiet footsteps and gentle whispers, and advises us not to go. We are compelled by brotherhood to go looking. Out the door and back down the hill toward the lake we go. While our intent is clear, our plan is non-existent. Fortunately, that doesn’t matter, as a figure staggers into view. Jook. He shambles into a pool of light. He is red-faced. In fact, he is quite covered in blood. And also mud. There is a boot mark on his forehead and he is shaking and incoherent. We have to get him home. The blind lead the blind back up the road. Back at the guest house we perform rudimentary first aid to try to prevent him bleeding out. I am not considered capable of primary care, so my job is taking off his boots. It takes me about twenty minutes. We are trying to convince him he will live, so that he can calm down. We are trying not to think about how to ring his parents and tell them there is a body-bag winging its way back to them on Aeroflot. After a period of panic, red stained towels and checking of dilated eyelids, it turns out that Jook is not about to die of his injuries. The vast majority of the blood on him comes from a deep cut on his hand. It seems like he has been using the same hand to check on all the places where he has been punched and kicked, and so has spread the red liberally. In fact, aside from the imprint of a Soviet-made boot-sole in the middle of his forehead, there are no visible injuries. We put him to bed, which he seems to like. He falls asleep and starts snoring. When we are having tea and biscuits for breakfast, he says that although he is a bit sore, it is a life experience, and that he is quite glad it happened. Johnny goes for a swim in the icy waters of the lake while we recline and think about the Finnish girls and what might have been. * I remember only vaguely. Time has made a mess of these memories. The gaps in this story are plugged with depressing architecture, salted herring, and other ready Russian stereotypes. Credit to Johnny for several of the pictures, a bunch of the above paragraphs, and general editing advice. Wow! This Jook guy seems awesome! As said owner of boot-print to face: It’s really not a travel ‘disaster’ but 24 hours of surrealism packed into a tiny town full of schoolgirls in french-maid outfits. One of those must-have experiences! great yarn, jase. now don’t you find it uncanny that those same school girls in french maid costumes (and pigtails!!) were still there 3 years later when i too visited lystvyanka?